These unique looking shore birds live and nest in huge colonies along the west coast of South America – from Ecuador and Peru to Chile. They use the rocky cliffs to build their nests and lay their eggs. Conservation Status: Due to moderately rapid population decline, inca terns have been listed as near threatened since 2004. 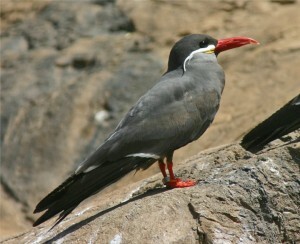 The inca tern will sometimes scavenge food scraps from sea lions and fishing boats.